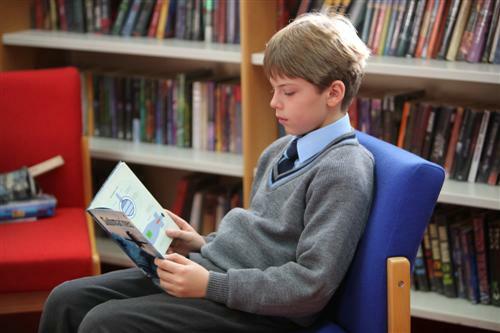 Papplewick’s Senior library for Years 6 – 8 is very popular with boys either looking for the latest publication from a favourite author or searching the non fiction titles to help with research for lesson projects or prep. The library is very well stocked with both fiction and non fiction titles. The fiction books include classic and modern titles and sets or series. Non fiction books include many science, history and arts titles and a good selection of biographies. The school Librarian is helped by a rota of pupil librarians who may apply for the post when a vacancy arises. After a short interview with the Librarian, when she is assured that they are naturally very tidy boys and will, therefore, help keep the school library spick and span, they are appointed to the role. Their duties include helping to choose new titles for the library, preparing new books for the shelves and chasing overdue books. We have visits from authors most terms. These give pupils the opportunity to listen to presentations and then to meet and talk with the author who will sign books for them. 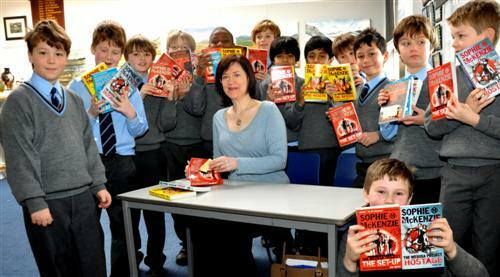 Recent author visits to school include Michael Grant, Sophie McKenzie, Robin Jarvis, Simon Mayo, Paul Stewart and Chris Riddell. A Junior library is situated along the Junior corridor which contains suitable books for Years 2 – 5 and is under the watchful eye of Mrs Jones and her band of pupil librarians.